The beans are ini­tial­ly sort­ed into 3 groups. As the beans com­plete their cur­ing, they need to be inspect­ed, sort­ed, and pack­aged for long-term stor­age. We’ve been doing this for 2 months now, and some of the ear­li­est beans to go into stor­age are ready for sale or to be made into one of our vanil­la prod­ucts, such as extract or syrup. The beans are ini­tial­ly sort­ed into three groups: Grade A, Grade B and Extract. This is accord­ing to mois­ture con­tent and appear­ance. They are then vac­u­um-packed and will be aged in that state for 1–6 months. This year’s har­vest is our first big har­vest and we’re not quite sure how it’s all going to get mar­ket­ed. Of course there will be online retail sales, and per­haps a cou­ple of shops on the island will car­ry our vanil­la prod­ucts. We are engag­ing our con­tacts in the culi­nary world, too. 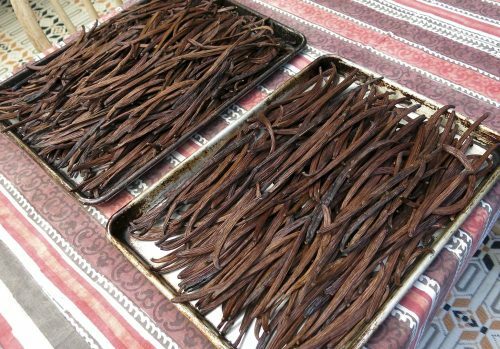 We’re inter­est­ed to know how the qual­i­ty of our beans mea­sures up with peo­ple who know vanilla…and of course, we will be sell­ing whole­sale to pro­fes­sion­als who are look­ing for arti­sanal Hawaiian vanil­la. This is the first year we are get­ting a full har­vest out of the vanillery. It’s been a good year, growth-wise, maybe even too good. The vines are grow­ing so thick­ly now, it’s hard to see the beans for har­vest­ing. 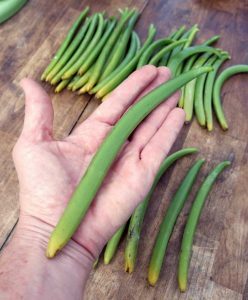 This har­vest sea­son actu­al­ly began on January 3, we missed a few ear­ly ones, but on that day I har­vest­ed 3 dozen beans. It seems to be com­ing in much ear­li­er this year. Last year’s first har­vest was in February some­time. I can only guess that the onset of the har­vest sea­son moves around a lot. Today’s har­vest was par­tic­u­lar­ly boun­ti­ful in terms of bean size. In the pho­to, I’m hold­ing one of the biggest beans I’ve ever seen, 240mm in length and weigh­ing in at 33 grams. The aver­age length for a grade I bean is about 180mm and 17g, so that’s sub­stan­tial­ly larg­er than most of the large beans. 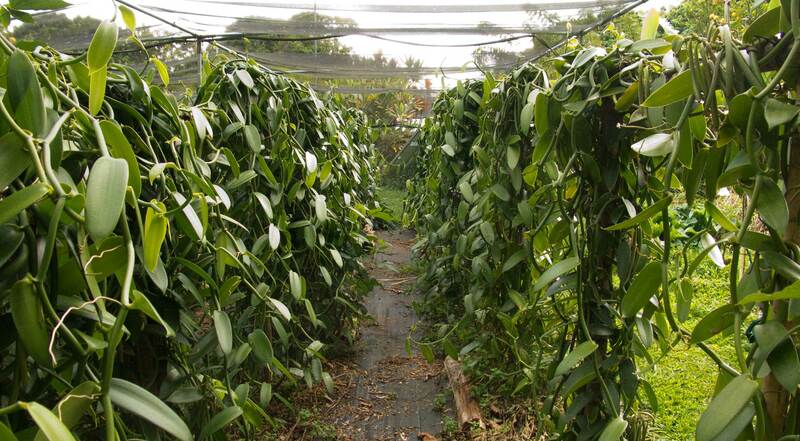 You might expect a bean like that from a Tahitian vanil­la (Vanilla tahiten­sis) plant, but we are grow­ing the more com­mon Vanilla plan­i­fo­lia, which pro­duces a small­er bean gen­er­al­ly. 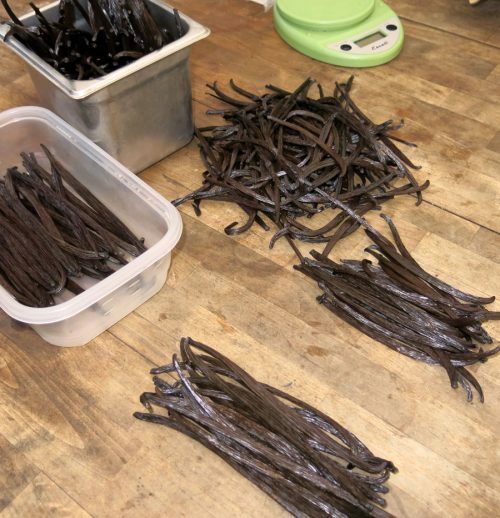 Vanilla bean green grades are by length: grade I is 150mm and over, grade II is 150 — 100mm, and grade III is less than 100mm. This is impor­tant because the pro­cess­ing is slight­ly dif­fer­ent for each grade. The larg­er the bean, the more time it gets in the kill bath and in the sweat­ing stage. For the beans in this kill bath, it is the begin­ning of a long process: 10 days of sweat­ing fol­lowed by 3–6 weeks of air-dry­ing. After that, the by now shriv­eled and dark brown or black beans are con­di­tioned for 9 months before they are grad­ed and made into extract. Took the beans out of their box today: it’s time to grade the har­vest. The last beans came off the open-air dry­ing racks two months ago, and they’ve been con­di­tion­ing in their box since then. The beans are grad­ed at this point, divid­ed into the two grades by size, mois­ture con­tent, and appear­ance. The grade A beans are bun­dled and placed in the con­di­tion­ing box for anoth­er 7 months, so there is a total of 9 months of con­di­tion­ing after the dry­ing is com­plete. The cured beans are sold to the culi­nary trade for direct use in recipes. 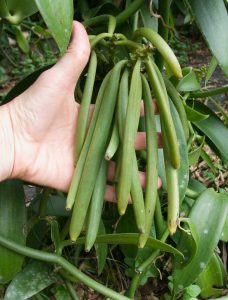 They are brown in col­or and filled with fra­grant, oily “caviar,” the seeds and pulp of the vanil­la pod after cur­ing. This is where the fra­grance of the vanil­la bean is con­cen­trat­ed. The grade B beans in part will be sold as grade B beans, but most will be used to make extract. We make two dif­fer­ent types of extract: one, a 100% local extract using Koloa Rum, made on the west side of Kauai. The sec­ond is an organ­ic extract using Prairie organ­ic vod­ka. The beans sit in the alco­hol for a min­i­mum of 6 months before we begin to sell them. It’s a good har­vest this year, I’m very proud of it! The beans are in beau­ti­ful con­di­tion.